EXECUTED AS leaders of Ireland’s 1916 Easter Rising, James Connolly and Patrick Pearse became nationalist icons as the country moved from British colony to independent, if divided, nation. Following their deaths, the two mens’ respective beliefs became blurred into a nationalist myth, coloured by the idea of blood sacrifice and moulded to serve the needs of republican politicians and paramilitaries for generations to come. The reality behind the myth however was that Connolly and Pearse held sharply contrasting ideas about the nation’s past and present, and each had a particular vision for its future. That two men with so little in common could come to be seen as sharing a goal resulted from circumstances beyond their control in the years 1913 to 1916, before when even the most imaginative chronicler of Irish history would struggle to find an inch of common ground between them. It was from 1913 that the paths of Connolly, the socialist union official, and Pearse, the non-political founder of an Irish-language school and prominent member of the Gaelic League, began to converge, a process resulting from the industrial unrest of the Dublin lock-out and the Home Rule crisis that saw physical force become a major component of Irish political life. Connolly was prominent in the lock-out, its failure and the failure of British labour to back it, being the first of a series of disillusionments that would cause him to rethink his strategy for attaining socialism and turn towards separatist republicans for support. For Pearse the lock-out brought an awareness of social problems and injustices that his romantic vision of Ireland and the Irish had hitherto overlooked but his conversion from language campaigner to orator for armed struggle came about about not through a desire to end the inequities of capitalism but as a means to repel the root cause of all Ireland’s woes, the English, even if it meant following the route of earlier Irish nationalists and dying a glorious death in the process. With the armed militias that originated in the lock-out and the Home Rule crisis in place, the outbreak of the first world war created a situation in which insurrection appeared possible and which, for Connolly, Pearse and a small band of others, seemed essential. To this end, Connolly and Pearse were inseparably aligned but their ultimate aims remained quite different: the former never wavered from a desire for Irish socialism perceived as now attainable by ridding Ireland of English rule and, in time, English capital. By contrast, Pearse’s vision was for cultural not economic transformation, the removal of the English allowing an unleashed Gaelic culture to bring about a self-sufficient, self-governing Irish nation. The Catholic Church that helped turn their deaths into martyrdom, the politicians that seized their legacies and the post-Rising nationalist historiography that quoted selectively from their writings and speeches, buried the socialism of Connolly beneath his nationalism and depicted Pearse less as a one-time politically neutral language campaigner than a lifelong revolutionary, while nurturing the idea of the two men having a common goal for Ireland’s future. THIS ESSAY-LENGTH BOOK IS ONLY AVAILABLE AS A KINDLE. 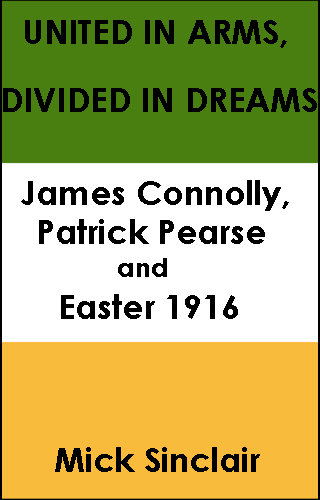 In this fully referenced essay-length study, Mick Sinclair explores the circumstances by which James Connolly and Patrick Pearse found unlikely common ground in the years leading to Ireland's 1916 Easter Rising. No other study among an immense historiography has examined the extent to which Connolly and Pearse really did share ideals as the Rising approached, or explored how the particular circumstances of Ireland from 1913 to 1916 caused them to be travelling the same road, even as their sights remained fixed on very different destinations.